good quality and stability, broadcasting level products, in-time inquiry response, fast delivery, Nice company, nice people. HDMI 8×8 matrix switch is support 8 input and 8 output, this matrix supports HDMI 1.3, HDCP, and DVI 1.0 protocol. Support for 12-bit color depth all HDTV resolutions including 1080p/60, and PC resolution up to 1920 * 1200. Automatically equalized, and the HDMI cable to the long distance to be compensated, to reduce the required number of additional input signal processing apparatus supports the input of up to 35 meters long term. This matrix can be excellent HDMI video and multi-channel digital audio signals transmitted by HDMI cable to the display device. 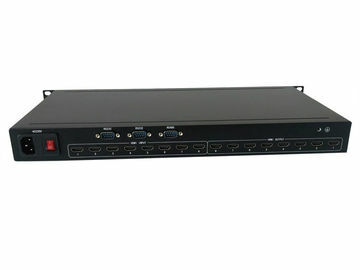 FL-HM-808: HDMI Matrix Switch supports 8 input and 8 output with compatibility with DVI.